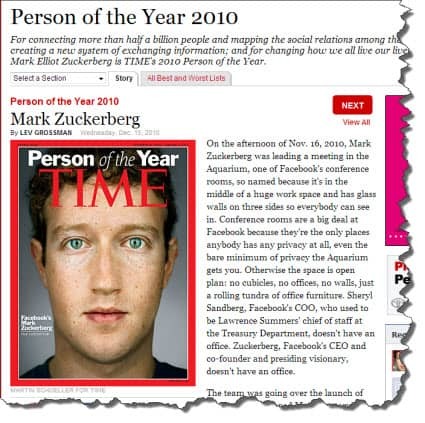 Well it had to happen, Mark Zuckerberg, the founder of Facebook is the Time Magazine “Person of the Year”. It was inevitable – an estimated 750m people now use Facebook and his struggles to bring the service to life are celebrated in an acclaimed Hollywood movie. Social networking is big business and an important part of online daily life for millions of people. Indeed, as you read this something like 27% of all other online activity at this precise moment is on Facebook. And that’s before we even count the traffic on Twitter or LinkedIn as well as other discussion forums. In other words, the web is almost entirely social. But it seems that many people have no idea why they are doing it. According to new research from the public relations company Wildfire PR some people are engaged in social media simply because they feel they “have to”. Indeed, one in ten businesses are only involved “because their competitors do it”. In other words, there appears to be little actual strategic thought or planning going on. Businesses appear to be “doing social” simply because it is there. Social activity makes you healthy. Research over several years has found that no matter what the condition, those people with a good social network and loads of friends tend to get better more quickly, are less likely to have less serious illness and also avoid depression. Now, a new study confirms that the more social networks you are involved in, the more quickly you recover from physical challenges, such as coping with the cold weather. It is yet more evidence to support the notion that being social, makes you healthy and better physically. A fascinating new study on brain degeneration suggests that when we stop thinking it causes energy changes within our brain that are associated with the development of neurological disease. For some time it has been known that having an active brain helps stave off conditions such as Alzheimer’s. Now, this new research suggests it is the actual stopping of thinking that is involved. When we stop thinking it causes energy changes in our brain which are linked to brain damage. What this implies is that if you relax too much, if you stop thinking, if you don’t keep your brain mentally active, you are making brain disease more likely. So, if you are constantly Tweeting, busy Facebooking and so on all day every day, your brain will keep active, helping it stay undamaged. As more and more people engage with social networks it appears they are connecting much more in the democratic process. We have already seen politicians brought to task using Twitter, others exposed via Wikileaks and more of them blogging in a bid to engage with us. This new study from the University of Pennsylvania shows that thanks to the combination of wireless networks and social networks, people are getting more involved in democratic activities. In other words, social networks are already boosting the political process and enabling a greater customer focus for businesses. Politicians and companies that do not serve their publics will get “outed” on social media. Being involved with social networks helps you help the world by ensuring we get better politicians and more responsible companies. So, these may not be the strategic reasons for the use of social media that Wildfire PR rightly point out are essential, but they are alternative suggestions for using social media. If the only answer you can come up with for using social media is “because we have to” perhaps these three reasons will provide more validity for you. And if they don’t, well just explain your use of social media by saying you are doing it because Mark Zuckerberg is your person of the year as well…!